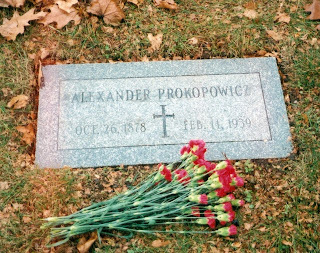 When Alexander Prokopowicz died in 1939, he was buried in Notre Dame Cemetery Section B, Lot 90, alongside his brother Joseph, who died in 1927. 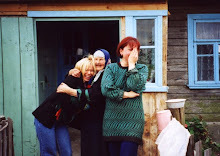 The large plot, owned by Joseph's family, marks the graves of several of his descendants. 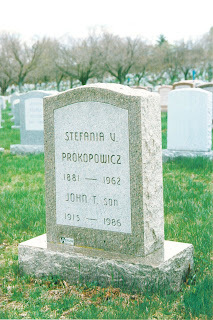 Stefania Prokopowicz was buried, in accordance with her wishes, in a single grave, St. George Section Lot 702. 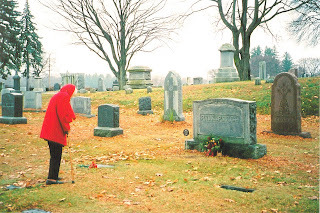 The cremains of son John were deposited there in 1986. 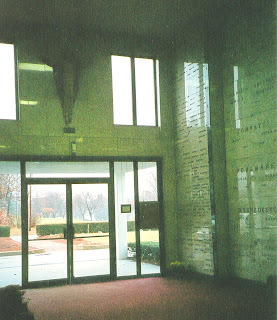 In niches near the entrance of the Notre Dame Mausoleum are the cremains of son Joseph, who died in 2001, and daughter Josephine, who died in 2008. 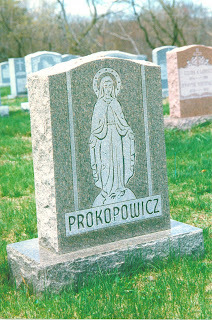 Son Adolph, who died in 1952, is interred at St. Joseph's Cemetery in Webster, and daughter Pauline, who died in 1985, in Brockton.